The X PRIZE Communications Team is proud of the coverage the Foundation has received these past few months. We can’t take all the credit ourselves, though. C. Fox Communications, our public relations agency of record for the Progressive Insurance Automotive X PRIZE (PIAXP), has been the driving force (pun intended) in securing fantastic features for the Auto PRIZE. 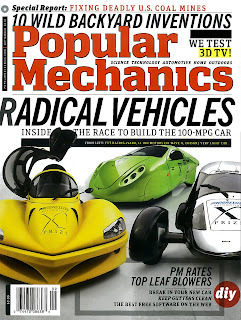 Have you seen the September cover of Popular Mechanics? Or how about our CEO, Peter Diamandis, who stopped by The Rachel Maddow Show to talk all things cars and PIAXP? Of course, some of our competitions generate buzz on their own. The most recent example of this is the $1.4 Million Wendy Schmidt Oil Cleanup X CHALLENGE. This CHALLENGE was announced on July 29 and, since then, has been featured in places like ABC News, BBC News, Christian Science Monitor, Fast Company, the Huffington Post, MSNBC & Popular Science, not to mention a live broadcast interview on CNN with Peter Diamandis & Wendy Schmidt (thanks to our PR consultants, not to mention Mother & Son team, Diane & Ian Murphy). We have loved the response that our 6th major competition has received, and we’re just busy trying to track it all down and archive it for our files! As amazing as our individual PRIZEs and CHALLENGEs are, the Foundation as a whole also receives media attention. I mean, the X PRIZE story is a fascinating one. So, naturally, there are journalists who want to spotlight the Foundation in its entirety, and we love that! It’s even better when our story reaches overseas and is featured internationally. This happened in the August issue of the German edition of GQ (see below). Ja! Spannend! (Thank you Google translation).